San Francisco's history is one of the country's most colorful filled with pirates, scallywags and the occasional earthquake. I appreciate a city that embraces is unsavory past and builds on a future that includes a most diverse populations. Remember, I'm from Florida, the land of anything goes. And since Bouchercon 2010 will be in San Francisco in just a few weeks, I 'm offering an ongoing look at mysteries set there. Dashiell Hammett: The Maltese Falcon. Granted when this novel about Sam Spade and the stuff that dreams are made of was published in 1930 it was a contemporary novel. Now we can look at what is often called the quintessential San Francisco mystery as a historical that also is as modern as when it was published. The alleys, streets and fog of San Francisco haven't changed much. There's also a plaque on the street where Archer was killed. I think it is a law that any mystery fan -- or anyone for that matter -- who visits San Francisco must read The Maltese Falcon at least once. 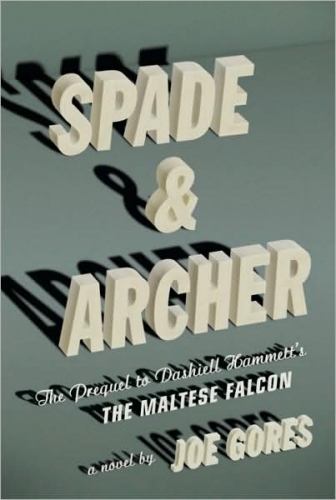 Joe Gores: Spade & Archer -- Published in 2009, this prequel to The Maltese Falcon delves into the background of Sam Space, his partner Miles Archer and other characters from Hammett's classic. Although he was first refused, Gores eventually got permission from Hammett's relatives to write the novel. If you're in San Francisco for Bouchercon, it's not too late to power read some mysteries set there. If you can't make it this year -- and we miss each of you -- take a virtual tour of San Francisco with our look at the city's mysteries. Marcia Muller: Any Sharon McCone novel. My friend Janet Rudolph recommends starting at the beginning of this wonderful series with Edwin of the Iron Shoes (1977). And that's a darn good place to start. But really any Sharon McCone novel will do. 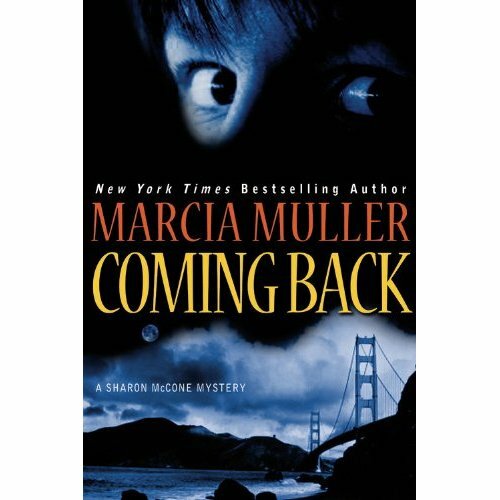 In this series, Muller has taken her private detective Sharon McCone from a wide-eyed innocent working tirelessly for a San Francisco legal co-op to a savvy businesswoman whose own agency is one of the city’s best-known. Along the way, Muller also has melded an acute look at San Francisco in her novels, blending factual and fictional sites to capture the spirit of San Francisco with a realism that becomes quite apparent to anyone who visits the area. If you like to start in the middle, try Dead Midnight, which looks at the demise of the dotcom industry. The newest McCone novel Coming Back will be released during October. Meg Gardiner: The Dirty Secrets Club -- San Francisco forensic psychiatrist Jo Becket looks at a series of odd suicides and murders in the debut of this series. Gardiner first came to the attention of American readers when Stephen King wrote a glowing magazine column about her. Gardiner, who was published in the U.K. first, went on to win the Edgar Award for her novel China Lake. She will be one of the guests of honor during Sleuthfest 2011, from March 4-6 (mwaflorida.org/sleuthfest). She will share the honor with Dennis Lehane. Rick Mofina: No Way Back -- A searing look at journalism and its ethics are at the heart of the solidly plotted No Way Back as a news story becomes personal for San Francisco crime reporter Tom Reed. Robin Burcell: Face of a Killer -- San Francisco FBI forensic artist Sydney Fitzpatrick looks at the 20-year-old murder of her father before his convicted killer is executed. Las Vegas attorneys Michael Cristalli and Marc Saggese are the real Defenders whose courtroom exploits are the inspiration for the new CBS drama that airs at 10 p.m. EST/9 p.m. CST on Wednesdays. On The Defenders, Jim Belushi’s role as Nick Morelli is the onscreen version of Marc Saggese while Jerry O’Connell’s Pete Kaczmarek is the renamed Michael Cristalli. This is part 2 of an interview Cristalli and Saggese managed to squeeze in between court dates. Q: The original The Defenders TV series, back in the day, was about a father and son who often tackled heavy issues; they didn’t always win either. Do you think there will be any confusion about your show? Marc: I hope there’s no confusion. It’s a complete fluke that The Defenders carries the same title as the 1960’s show. Before CBS came on board, we were involved with a documentary series produced by Joe and Harry Gantz titled “The Defenders” and CBS stuck with the name when they became involved in the project. Michael: I don’t know too much about the previous Defenders show. I think it’s been such a long time, there won’t really be a mistake. The Defenders is about the legal system in Las Vegas as it stands today. Q: Has the American public’s attitude toward lawyers changed during the past decades and what do you think it is? Marc: There’s been a definite change in the perception society has to the role of the prosecutor. I think defense councils have been getting a healthier reception through the years, being seen as someone who fights for the little guy in an effort to defend his rights. Michael: The public’s view has changed on the justice system in general. There’s a lot of distrust of government these days. Society is more suspect of the police and the authorities and sometimes there may be a rush to judgment. Q: Yet, we never seem to loose our appetite for stories about crime, the law, etc., both in the newspaper, TV news, TruTV, etc. Why? Marc: Crime is a realm that very few people deal with on a regular basis. So there is some level of curiosity about what goes in that courtroom. The world of law really is a kind of mystery. Michael: We have a huge appetite for the law and the drama associated with it – it’s human nature. It’s when OJ was driving in his van, being chased by helicopters. It’s about the sensationalism of the big trial. People are attracted this kind of human drama. Q: You’ve handled some pretty high-profile cases that, on the surface, seem as if the defendants are guilty, given that, how can the series make the audience care about these two attorneys? Marc: People who we represent are sometimes completely innocent and sometimes they have varying degrees of guilt for a particular defense. Guilt is a complex definition. Michael: Defense lawyers are portrayed as silk tongue individuals in fancy suits who get paid a lot of money to represent some scumbag who’s guilty. In reality, we care about our cases. We connect with our clients, they have children and mothers and fathers. You see the humanity that goes behind these people and the drama that exists in their personal stories. We fight every day for a cause, not to get a paycheck. The one unique quality of a good defense attorney is belief in the Constitution – truth beyond a reasonable doubt and the rights of all individuals. Q: What, if any, role did you two have in the writing, stories, scripting, etc, in the series? Marc: Michael and I communicate with the team of 14 writers daily – up to three times a day. They want to make sure that the cases depicted on the show are legally in line. We are intimately involved and really enjoy that. Michael: As consultants on the project, we love working closely with everyone involved, especially Jim and Jerry. Q: Did you go to the set often? Marc: We’ve been on the set a number of times, and we usually go for two or three days a time. It’s great to see it happen in front of us live – there must be 100 or so crew members at every shot. So many people are involved to make the show what it is. Michael: We continue our day jobs, but try to get on set as much as we can. Q: How will this series affect your practice? Or has it already? Marc: Once it has a viewing audience, we hope it will improve our practice. We definitely want to draw people to our firm. Michael: I hope people realize that we’re trying to project something positive and shed light on a sometime unfair justice system. Q: What would you do if they were Joran van der Sloot’s attorneys? Marc: I would recommend first that he not communicate with the media. Attorneys should do all of the communicating for him. He has certainly been his own worst enemy. Michael: When cases are high profile and portray a client negatively, you sometimes have to change the perception of the defendant’s character. The client always needs to be humanized; something the state doesn’t want to do. Q: Have you ever been afraid of your clients? Marc: Never one, not for a second. Michael: We have represented the worst of the worst, but I have never felt fear for my safety, even when I’m alone in a cell sitting face to face with a defendant accused of the worst acts. That’s because these people need us and look to us for help. They want to talk to us and want us to help them out. Q: Would you ever turn down a case? Marc: I’m not going to take a case that there may be a possibility that I will not be fully invested in it. I will never half-heartedly represent a client. Michael: Everybody’s entitled to a defense – it’s an inherent right in our system – but we personally have to believe we’re fighting for a cause and have to believe in our client. "You don't pay for anything by being dead. That's when you stop paying for it."